I always stop by this place. There are tons of other stores around, I believe they are franchised and the items differ from store to store. I really like one of the owners here, she is always very nice to me. Customer service is very important! Especially since I go there so often. There pre-made food is always really tasty. Funny this is that the lady who makes a lot of the stuff is one of my friend's bf's mom. Confusing huh? Small world too. Ever since I was young, I have always loved Beef in Sesame Pocket. It's a typical Taiwanese snack, breakfast food. They do a decent job here and you have the option of spicy and regular. I am not a big fan of spicy but now I get the spicy because it has more flavor and it isn't too spicy. 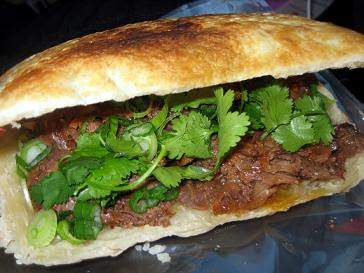 They toast the pocket and fill it with marinated beef, cilantro, green onions, sesame oil, & soy sauce. Today was hot so we also got the Shaved Ice with 3 toppings for $3.95 and a Milk Tea. It was very refreshing and cooled me off. All in all I like coming here a lot. Nice service and lots of yummy Taiwanese pre-made food! They also sell different types of jerkys and snacks. I love the Fruit-flavored Beef Jerky! It's kind of expensive, but definitely good. Stop by some time check it out and pick up a snack to give them a try! Don't forget to get a stamp card if you get a drink or shaved ice!